In June, Andy Webster, one of our landscape architects will be taking his final exams towards an RHS Level II Certificate in the Principles of Horticulture. Fira have funded his study which has been ongoing, part-time for the last two years. 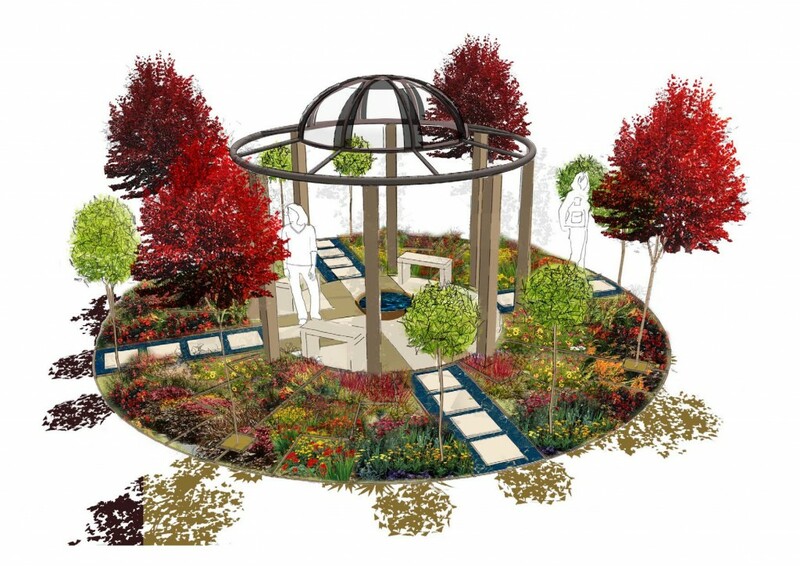 The group with which he studies have been also working hard for the last few months to design and implement a Show Garden at the RHS Malvern Spring Festival at The Three Counties Showground. The RHS have approved their design and construction is already underway. They are hoping to complete construction in approximately three weeks, prior to judging by the RHS and then opening to the public from Thursday the 5th to the Sunday the 8th May. The structure and hard landscaping of this formal garden is inspired by the beautiful ancient ‘Millefiori’ glasswork artefact found amongst the Staffordshire Hoard with its literal meaning of one thousand flowers. It is a colourful and vibrant spring garden with vertical and horizontal interest wrapped around a wonderful arbour – inviting the visitor to take the journey to the centre and pause for a moment to enjoy the space within, whilst being enveloped by the warmth of the colour themed planting below and bathing in the coloured light beaming down from the stained glass dome above.